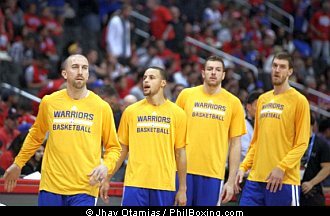 SAN FRANCISCO -- The Golden State Warriors made 40 of 80 field goals en route to a thrilling 109-105 win over the Los Angeles Clippers Saturday afternoon at the Staples Center. David Lee led the charge with 20 points and 13 rebounds, guiding the Warriors to a 1-0 lead in this best-of-7 opening round series. Golden State's star guards, Klay Thompson and Steph Curry, combined for 36 points but the duo dubbed as Splash Brothers made only 13 of their 36 field goals. That didn't stop the Warriors, who made 11 of 27 triples and out rebounded the Clippers,68-50, despite missing the services of injured center Andrew Bogut. Harrison Barnes recorded 14 and eight boards while veterans Jermaine O'Neal and Andre Iguodala combined for 21 for the Warriors. "We had a tremendous will but this series is far from over," Golden State head coach Mark Jackson said after the close contest that saw the Warriors rally back from an 11-point deficit. Chris Paul had a monster night with 28 points, 7 rebounds and 8 assists, but the dynamic Clippers point guard also had 6 turnovers. Blake Griffin muscled his way to 16 points but the power forward was limited to 19 minutes with foul trouble. J.J. Redick finished with 22 for the Clips but Jamal Crawford settled with just 9 on 2-for-11 shooting. "We made mistakes. Some of us, myself included, maybe wanted it too much and came in with an expectation. We just need to relax," Griffin told ESPN on the heels of his team's 17 turnovers. Photo: The Warriors warm up at Staples Center before engaging the hosts Los Angeles Clippers in a thrilling Game 1 Western Conference playoffs game. The Warriors nipped the Clips, 109-105. Photo by Jhay Otamias.